Last week, in the closed session of the AT board meeting there was an item about running pattern of the rail network after completion of the City Rail Link. It sparked a bit of debate about the merits of the purple line. With this post I thought I’d look at why I don’t think it’s a good idea. The basic version of the future operating pattern this is below. The CRL will be benefit a lot of people and none more so than those on the Western Line. But the one group that will be the most negatively impacted will also be on the Western Line, those who travel to Grafton and Newmarket. To start I thought it would be good to quantify just how many trips that is. So, I turned to the rail station data that Auckland Transport have provided me in the past. It shows for the year to 30 June 2017 how many trips were made using HOP from each station to every other station. In total it represents about 17.6 million trips, or about 90% of all trips for that year. The data shows that there were just over 3 million trips boarded at stations between Swanson and Mt Eden heading towards the city and a similar number of trips in reverse. More people on the western line are travelling to other stations on the Western Line than to Grafton and Newmarket. This is a good thing regardless of what happens with the purple line as most can benefit from the improved frequencies the CRL can provide. You will notice there’s over a 100k difference between boarding and alighting at both Grafton and Britomart. We believe this is due to what we call ‘down hilling’. In other words, they’re getting off at Grafton in the morning and walking, cycling or catching a bus down to Uni but at the end of the day, instead of going back to Grafton, they keep heading downhill to Britomart. Post-CRL I assume these will mostly shift to the Aotea station. This suggests that in total, about 21% of Western Line trips are genuinely to or from Grafton or Newmarket, or about 8% of all trips. Given western line trips to those two stations are already well served, we should expect even if the numbers stay about the same, the percentage of trips affected will drop as many more people will be travelling to the city. However, we also need to consider that proposed purple line only goes as far as Henderson. Up to 14% of those trips are to or from stations west of Henderson. All of those passengers would need to transfer services anyway. Western line services to Grafton and Newmarket, at peak at least, are currently pretty good in the Auckland context, being every 10-minutes. That’s in large part because those stations are ‘on the way’ to Britomart. But given the numbers above, and infrastructure constraints, it’s hard to justify that level of service in the future. Even if you could find enough money to run the purple line at 10-minute frequencies, there would almost certainly be something better on the PT network to spend it on. The same goes for track capacity and even the trains themselves. As such, the purple line is only expected to run every 20-minutes, that’s outside Auckland Transport’s own definition for a frequent service and certainly not something you’d class as ‘turn up and go’. So, what does this mean for travel times? In this scenario, turning up right on time would net you the same travel time, just miss a train though and you’ve got a 20-minute wait giving you a total time of 52-minutes. That’s a wide variation. Instead of waiting, more likely you’d just catch the next CRL bound train and just transferring at Karangahape Rd. Taking an average wait time would mean 42-minutes. AT opening, the CRL is said to have the capacity for 15 trains per hour per direction. More detailed versions of the plan above show a base pattern of 6tph on the red and blue lines with additional peak only services, three per hour from Henderson and three per hour from Papakura but travelling via the Eastern Line (which is the purpose of that peak only dotted line at Manukau above). So 9 trains per hour from Henderson through the CRL. That’s a train less than every 7-minutes. CRL documents suggest trains would take about 3-minutes from Mt Eden to Karangahape Rd so about a 33-minute travel time all up. From Karangahape Rd it would take about 4-minutes back to Grafton. This gives us a best-case scenario of 37-minutes, 5-minutes slower than the similar scenario for the Purple Line. However, the worst-case scenario of just missing your train at both Henderson and Karangahape Rd, at 51-minutes, would still be faster than the worst case for the Purple Line. The average would be about 44-minutes. It is expected that with further upgrades, the CRL would be able to move up to 24 trains per hour per direction. Assuming they’re evenly split across the lines that represents 12 per hour from Henderson. In this situation, the average drops to 42-minutes and the worst case to 47-minutes. We know that AT are planning on improving travel times on existing trains. 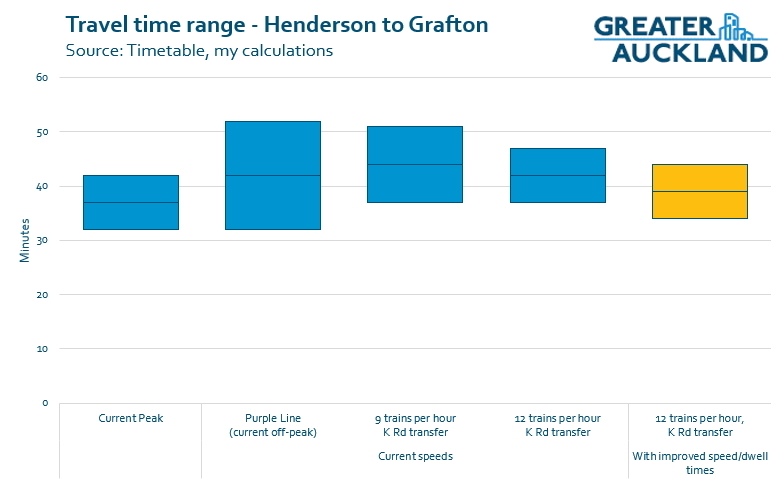 We don’t know just how much time they’ll save but using the calculations I wrote about recently, travel times for Henderson to Karangahape Rd could see up to a 3-minute saving. That would benefit all of these options relatively equally but I thought it was useful to include to compare to the current state. It would mean the scenario above, with 12 trains per hour would a range of 34-44-minutes, only two-minutes slower than what we have now. I’ve highlighted these travel times in the graph below. The line through the middle is the average travel time. On top of the travel times, there’s also something to be said for a simple, easy to understand network. To be able to turn up at a station and catch the next train that comes along without having to think if that’s the one that will get you to your destination the fastest or have weird gaps in the timetable because one train every 20-minutes goes somewhere else. A better use for the resource? Given some of the travel times above, the purple line seems to be more about running trains to satisfy a model than running a simple, frequent network. As such, it goes against the very principles of the new network AT are rolling out right now. In my view, the purple line is something we should only consider if we had spare money, infrastructure or trains available, something I don’t see happening. Even running the purple line as proposed isn’t going to be cheap. It effectively represents using about 1/3rd of the entire capacity of the Western Line to move what is already less than 1/3rd of the trips, with that percentage about to plummet as people flock to trains to the city. At 28.6km between Henderson and Otahuhu, each run covers about 4km more distance than a service from Swanson to Britomart (post-CRL). That means that for the cost of the purple line, you could extend the initially planned peak frequency to cover the entire day. That would benefit everyone, not just those going west-south. It turns our rail network into much more of a metro style operation. Another issue I have with the current plans, it’s absurd to spend $3+ billion to, among other things, shift the west up to 20-minutes closer to the centre of town and then not improve services to almost 20% of the Western Line. That’s because there is no plan to increase frequencies past Henderson with both the extra peak services and the purple line starting from there. As such, another alternative is that you use the purple line resource to send those peak-only services past Henderson. There’s probably enough operational resource to do both better off-peak services and sending them all to Swanson. It’s not just running trains either, for example we will need approximately six trains to run such a service. At close to $9 million per 3-car train, that’s about $54 million in trains before you run anything. While we have trains now and more on the way, we’re going to need all of them just to service our existing network and the extra frequencies that will be needed in the future. By now I think it’s pretty clear that I’m not convinced of the merits of the purple line. Without the purple line we also wouldn’t need the extra platforms at Henderson – additional advantage and more money to spend on other improvements. Extra platforms at Henderson (and Otahuhu) will allow Limited stop trains with an all stops following immediately behind. That would be a huge improvement, definitely worth spending money on. Hardly, the starting train plan above has twelve trains an hour on the western line, one every five minutes. At best your limited stops would save about three minutes before it started hitting all the red signals following the next train in front. So no point. An limited leaving Henderson would be crawling behind the all stops before New Lynn. Well change the plan, take out the train in front to make way for the LS service, recognise that peak time has different requirements. Also I can’t help thinking that if the Purple line was running now, it would get back so much of the time wasted fluffing around at Newmarket changing ends. Seriously? You’re plan is to cut a train of capacity *and* make a ten minute hole in the timetable so you can put a limited train in, which then equates to a fifteen minute hole for the stops that are skipped. Yeah nah, that’s worse service than we run today. Just run all the trains frequently on the same pattern, instead of trying to save a few minutes going express you can save a few minutes by not having to wait in the first place. A limited stops service only really works on a double tracked line if there are 20 min gaps between services. Are you seriously suggesting we have worse frequency than we currently do on the western line once the CRL opens? There would be an all stops service sitting at Henderson on the new platform which would leave as soon as the LS service has departed Henderson so the ‘hole’ wouldn’t be particularly dramatic. You have to remember this would be one service only during the weekday am peak, not the end of the world. It would also be a bit pointless as it would have likely caught up with the previous all stops service by New Lynn or Avondale and would then crawl behind it for the rest of the trip. There would need to be triple tracking for express services to work effectively. Hard to see what the point of one train a day that does this is? I remember the bad old days of single track when trains departed New Lynn at 20 or 30 minute intervals and we had the aforementioned one limited stops service per am peak. It always amused me that by the time we were rocking past Mt Albert someone would seek out the ticket collector (? I forget what they called them in those days) and ask why the train wasn’t stopping. Nearly every morning. Despite PA announcements on both the platform and the train. And we’d usually come to a halt between Kingsland and Boston Rd (as it was then) as we caught up with the full-cream service in front. You’d need loads of additional switches and tracks making it quite an expensive operation. If we could fix the dwell times you’d probably be looking at around 5 minutes time savings on the Western Line to Henderson. At the same time you’d be making scheduling much more complex. It wouldn’t even be particularly useful unless you could run it at a high frequency anyway. I commute from Sunnyvale to Ellerslie via a change at Newmarket. At the moment, about half a dozen people on my train (the 5:51am) also change at Newmarket for points South on the Southern line. As long as my journey time (currently 50 minutes) diesn’t increase I will be happy. I wonder how many of those trips to Grafto and Newmarket are from the “inner” part of the western line, say on the city side of New Lynn? I ask this because it should be pretty easy to change the New North Road buses so they go to Grafton and Newmarket instead of the city. Essentially you would swap around what train and bus do now, to something much more sensible with the higher capacity mode (rail) focusing on the main destination (the city). Yes could be good idea if NW light rail is also going to the city ctr. Crazy idea, nobody wants to go back to buses. I suspect the frequency will be more like 5,5,10 from Henderson to the City rather than a train every 7 mins. I imagine they will want to keep the dark green line at 10 min frequencies so that Swanson, Ranui and Sturges Rd are still turn up and go. The light green line will likely be slotted in-between at 20 min intervals. I’m not sure what are the options besides running the purple line (perhaps running that service to Onehunga if there is space). I know that there are about 20 people in our office that live out west and would prefer a direct service to Newmarket. Newmarket is the second CBD of Auckland. I think you overemphasize the potential problems about having two services running on the same line. We currently have it on part of the southern line and have had it in the past. It works ok overseas, so it should not be a problem here, especially since we have service announcements, passenger Information displays and signs on the trains. From the data above alot of people use Grafton (hospital, schools) and Newmarket). I think you forget that the University has big plans for the Newmarket campus (including moving TeCol to that site). So in the future more people will use these stations from the west. So having a service from the west to Newmarket makes sense (not sure if it is the purple line or something different). I think it is worth the investment in this particular case. It will save people time and be more convenient. Faster and convenience are important factors for many people. Not having a service from Newmarket to the western line will turn off more people from PT, in my opinion. Looking at your figures there are between 21 to 24% of people using the Western line that get off here. That is a significant portion of the people using the western line. There will be a demand for a direct service to Newmarket along the western line, and in future with developments in Newmarket (Auckland Uni and 277 redevelopment), it is likely that that demand will increase. It is worth investing the money this service. Not all trips are to the CBD…as it has been pointed out in the blog before many people commuting trips do not begin and end at the CBD. Investigating in a CFN which reflects PT travel needs will result in a better PT experience for more people. (Investing in a Manukau to Papakura heavy rail link would also be smart as well). Wouldn’t you just do a transfer between the normal lines tho? Why wait twenty minutes for the purple train when the other ones run every five minutes at peak? I reckon they’ll cancell the purple line within six months, if they even start it. How long running that thing empty back and forth all day long before they pull the plug? CRL trains are going to be jam packed from opening day, won’t take them long to chop the purples and use the trains for more tunnel capacity. I guess my point is simple. We should retain a direct western line link to Newmarket. Not sure if the purple line is the best way to do it but sending all western line to CRL and making people transfer is a really bad idea. Imperial Advocacy league raises a good point in the fact that is 20 minutes frequency enough and I would say no. I would say you should have a 50%/50% split (say like at Papatotetoe with Manukau and Papakura services). – Watercare plus a number of large environmental and engineering consultancy firms. – recreational (Domain, Museum, cinemas plus swimming, etc). Newmarket is growing in terms of jobs, retail shoppers/visitors and education. So they is going to be a lot of future demand for this destination. Newmarket is Auckland second CBD. It is also important to note that less than 20% of Auckland business are located within the CBD. Therefore it would foolish to make the heavy rail only CBD focused only. Less than 60% current journeys either start or end there. It has been argued (correctly in my belief) that focusing on the CBD as the ultimately destination is unwise and that more cross town links are required. Therefore, making it more difficult (increasing journey times and more transfers) for people living out west by not have direct link to Newmarket is short-sighted and would be counter to the concept of a CFN. Could a direct western link to Otahuhu make it easier for people to use Auckland PT(I think so) (Otahuhu is an important hub). Is there a demand for it (unknown but I am skeptical). But the solution to move the CRL to a central network (spoke type network system) seems like a leap into the past. Some kind of Western line direct connection to Newmarket is needed. How best to do it -should be the question. That doesn’t answer my question tho. Newmarket is important and good to get to from the west… but why don’t you just transfer between the normal lines, or just stay on the western line. Why an extra line? What about a direct line from the east then. We are missing one by that logic. Where is the pink line skipping Britomart and running from Orakei to Newmarket? Is the east not as important as the west? Will you argue for the extra east to Newmwarket line too? By transferring you increase travel time and Inconvenice for people. Currently people using the western line do not have to transfer. So you are offering people traveling from the western line a degradation in services from what they have. Look at the number of people using either Grafton or Newmarket on the western line. It is more than most western line stations. The proposed CRL transfer is a hassle and will take longer. Yes it can be a back up option but it is an inferior service to what they have. First they have to travel to Aotea or K Road station, then they have to transfer to another service then go out again. This is going to be a slower journey than they have now. It is not going improve there experience. There is only minimal infrastructure requirements, post -CRL there will be capacity at Newmarket do run these services. AT does have the resources to do- Matt argument that there is not trains is not correct. It can be done, I have talked to a person in AT and he said with the budgeted train orders it can be done. So all the post is that it is argument is that it is philosophically better to send all trains to CRL loop. I disagree with that. Both of these stations are important destations on the network. The boarding at these stations are higher than a number of other stations on either the southern line. The demand for these stops will only increase over time. I am not convinced that they need to go to otahuhu. But having a 3 car train every 10 minutes on the western line to Newmarket should be a minimum during peak travel. The demand is enough and it would give 5 minute frequency along the western line. I still don’t know how that red line is meant to work for the end user. Is it both a ‘southern line’ from Pukekohe to Aotea and an ‘eastern line’ from Manukau to Aotea? So at Aotea the train changes from a southern line to a eastern line train? Or is it ‘semi circle line’ from Pukekohe to Manukau – which just happens to loop back on itself in a very confusing way. That ‘peak only’ segment makes it even more confusing. And at Middlemore there will be four trains, all of them red. Two will be going to Manukau, two will be going to Pukekohe, but in opposite directions. This is an operational diagram so the operators know where the train starts and finishes, doesn’t necessarily represent what a network map would look like in the future. The third diagram in this link gives a hint as to what might be planned, although I hope they tidy it up a bit! I travel from Glen Eden to Ellerslie every day, and you might think I would be an advocate for the Purple line which would be a single trip and easier than my current trip but going to K’rd and transferring on the Red Line on a 10 minute service seems a much better option as it supports all of Matt’s points above and provides flexibility for me. Yes some people just keep thinking like a car driver and can’t fathom a transfer (or connecting bus to a park and ride station for that matter). As long as transfers are quick and easy. It works for London. Mostly. Transferring at K Rd will be both: very quick, high frequency service; and easy, all weather flat island platform… very London-like in fact, like switching from the District to the Circle, as they are a couple of few lines there that are interlined, ie different lines running on the same track, no need to get to a platform serving a different pair of tracks. Ari, it even works in Sydney. London has just spent a fortune putting in Crossrail, to get away from the “all change” mentality on the east-west axis. And in the 1980’s “Thameslink” provided a much needed through-connection north-south. Forced transfers on arterial flows are something to be avoided, or engineered-out when possible. That said, if the purple line turns out to be a damp squib then I am sure it will be re-assessed quickly. At this stage the decision has been made to give it a go, and despite people’s reservations about it here, the proof will not come until it is tried. Best not to write it off prematurely. You may be surprised! London has spent a fortune because of capacity constraints, not to remove transfers, although that is a side benefit. There is no reason if we have capacity issues in the future that could be alleviated by the purple line that it couldn’t be introduced then. Nobody has mentioned the fact that each morning and afternoon literally hundreds of school kids travel on the Western Line to and from Grafton to go to St. Peters College and Auckland Grammar. Some of you may travel outside their boarding times and never see these kids. If the purple line is abandoned, how do these kids get to school? By transferring at K Road, it’s not like they are planning to stop servicing Grafton with trains. School zones exist for good reason. Jezza and Jimbojones, gee that’s dumb. All the way in to K Rd and then back out to Grafton, wasting 8 minutes plus transfer wait time. Might be 20 minutes wasted. I have no connection with the schools or students, BTW, but do go fairly frequently to Grafton (to Jaycar in Boston Rd) from both the west and the south, so the purple line will be great for me (a real hassle from the south at present). The purple line won’t offer the current level of service either as it will only run every 20 mins. There is every chance the kids will have to catch a train 10 mins earlier to get to school on time and wait 10 mins longer at Newmarket on the way home. You may think it is dumb, but I’d say spending $54 million on trains plus additional ongoing running costs just to make sure no-one is worse off than they currently are is the definition of dumb. I doubt it’s 8 minutes run time from Mt Eden to K Road, then K Road to Grafton. In total that’s only 2,800m. Eight minutes would suggest the trains are running at only 21km/h. More like four minutes and 40km/h. Wait time would be at worst ten minutes, more like 3 to 4 mins at peak times. So you are looking at a total delay of about eight minutes. That sounds all right to avoid waiting up to twenty minutes for a direct service. I think you are missing the point with the timetables. The problem with lower frequencies is often at the other end when the train drops you at your destination well before you need to be there. Because I don’t think we should design a transit system that forces people to schedule their lives around a timetable of infrequent departures. All that means is that people can’t travel when they want to and have to waste time either before or after the train. You don’t have to meet an exact departure time once every twenty minutes when you drive, why do you want people to have that when they take trains? What happens if you are one minute late for your train, something as little as missing the ped crossing phase at the lights in front of the station can delay you two minutes. What if someone wants to talk for a minute as you leave work, or you forgot it’s rubbish day and have to take a couple minute to roll the bin out. Or whatever. Then you’re suddenly twenty minutes late for where you want to be. To get to the station at the right time you’d have to allow a good ten minutes extra to be certain, so the trip becomes ten minutes longer every time. And let’s not even entertain what happens when they cancel the service due to some disruption or whatever, and you have up to forty minutes to wait for the next service. It’s not as if by having a 20 min frequency on the Purple Line that everyone travelling west-south is forced to wait 19 minutes if they miss the train by a minute. As Matt acknowledges, what they would do is take the next city-bound train and change at K Road, like Matt wants us to do. My calculation of the best/average/worst times for the Henderson-Grafton trip “direct” are 32/42/52 min including a 0/10/20 min wait at Henderson. Assuming the Purple line trains are evenly slotted between the CRL trains (ie standard 5 min wait) then making the transfer at K Rd (wait times 0/5/10 min) would have a best/average/worst travel time of 42/47/52 min including the 5 min wait at Henderson. That is, the best case and average case scenarios for the “direct” route beat the K Rd transfer hands down, and even the worst case turns out to be equal in travel time. The addition of the Purple line is not about frustrating passengers, it’s about providing them with additional choice, and I applaud that. Personally, if you gave me the choice of a direct train or a transfer, I’d take the direct train any day for the sheer convenience of not having to transfer and welcome the five or ten minutes that I’ll save. And if I happened to miss the train by a minute or two I’ll still be secure in the knowledge that I won’t be disadvantaged at all time-wise by making a transfer in the very worst case. David, you seem to be arguing in favor of the purple line by pointing out how the alternatives are just as good and that it’s not worth waiting around for! Not really Nick R. From what I read, David is being entirely logical. Situation 1: You turn up at Henderson, wanting to go to Grafton. The direct purple line train comes, you are happy at your direct and faster service. Situation 2: you turn up at Henderson, wanting to go to Grafton, but you‘ve just missed the direct purple train. You are disappointed at the inconvenience, but you take the CRL service, change at K‘Rd and end up at Grafton. Not quite as convenient, but gets you there in an acceptable time. This is how I use overseas interlinking metro networks and how I‘d guess a lot of people would approach the situation. People are forced to schedule their lives around timetables by work, by school, by a whole range of activities, everyday! All those if, buts and maybes you came up with apply to any situation where you don’t leave enough time. It’s called being organised. Obviously I take the train rather than drive because of it’s advantages such as, not getting stuck in traffic or worrying about parking, so I’m prepared to tradeoff the constant availabilty of the car vs having to work to a timetable for the train. You’d be surprised how accepting most people are of 20 min frequencies if it means they avoid a totally unnecessary detour. I don’t know about you, but personally my various work, school and other activities are exactly why I want a system that doesn’t run to an infrequent schedule. I usually don’t get to decide when work is done, or when my other activities start or finish from one day to the next. In that context ‘leaving enough time’ simply means waiting around because the train isn’t very frequent. If that’s not a problem who bother with 20 minute headways? Why not one an hour. Would still be enough seats for everyone. Just need to be organized right? Also makes me wonder why they run every ten minutes at peak, and why patronage went up so much when they increased the frequency. Would be cheaper and easier to run all six car trains every fifteen minutes. Zippo, some people around here take the Outer Link instead of the 030 because they can’t be bothered finding out what the 030’s timetable is, whereas there’s no point finding out what the Outer Link’s timetable is. Just turn up and wait. Others of course arrive nonchalantly at the bus stop just before the bus every time because they’re glued to the real time board app. And then some use the timetables. Different brains. I thought the research was pretty conclusive that overall, 10 minute frequencies or less are game-changers for a big part of the population. The difference the 18 bus route has made here due to its frequency has been massive. School zones exist to protect teachers jobs. Nothing more. Sorry Heidi. Officially it is so the Ministry of Education can make best use of their resources and not have to build additional facilities at schools perceived as better. In reality they don’t want to close failing schools. They don’t give a crap about transport, friends or cycling. Actually, they do. Ever read one of the curriculums? I used to know the ECE curriculum reasonably well, and it was full of the importance of connection with local community, local friends, local geography. I remember at the time thinking, how the dickens do you achieve all of this if you’re ferried half-way across town? Of course the MoE have to make best use of their resources. The problem arises when those resources have been cut by voters always after lower taxes. All children deserve a good education, regardless of who their parents are. Provide wealthy parents with an opt-out from their local school, and the MoE loses their collective pressure for taxes to be sufficient to make sure all schools are of the desired standard, including their local school. I was on an establishment board then chair of a BoT and experienced the MEdu views on transport first hand. They have a transport policy written in 1914 that requires kids to walk ridiculous distances before they will fund transport or if there is any type of public transport they get an automatic out even if a small child has to cross a 100km/h multi lane highway. Officially they tell you education is about the children. The reality is schools are places of employment first and foremost. They exist for teachers, and teachers and their unions shape every aspect. I eventually came to the conclusion that schools are set up as a form of penitentiary to incarcerate kids for the crime of being young. Education is treated like a form of make work to keep them busy. The best you can hope for is that the school attracts some teachers who give a damn. When you find a school like that you apply out of zone or shift into their zone. The other schools are just a holding pen. So if AT are going to be slaves to the Model 2 Connective Network option then why are they building a Central Rail Link? According to that model everyone can change at Newmarket. Because no trains go to Aotea or k’rd at present for starters. It’s also a lot slower for the main central destination. Although cut and cover from Britomart to Aotea would have cost a fraction of the cost of the CRL. K road could be served by light rail. Exactly. The truth here is that they apply whichever model best suits the CBD and if that shafts people who are not going to or from the CBD then they don’t really care. Perhaps if AT get rid of the purple line they might like to revise down their benefit cost ratio to take into account the additional time they are going to impose on existing travellers who are inconvenienced. You mean revise up, with the shorter wait times for 99% of passengers by putting the extra service frequency on the main pattern… or correspondingly saving the operation and capital costs. Either way it would go up. Sorry but there is no way that running duplicate trains from Henderson to Otahuhu all day seven days, so a tiny handful of users don’t have to spend about the same amount of time transferring, is a positive contribution to the BCR. Have you factored in the extra land and demolition costs that would be required to build a station the size of Britomart at Aotea? Even then that would offer no frequency increase over what we currently have, all it would achieve is save people the walk from Britomart to midtown. How would you deal with growth in demand? The connective network model means you deliver a top layer trunk grid directly linking the primary activity centres, and allow connections between the secondary destinations. Providing a direct trip to the biggest activity centre in the region, and having folks transfer to get to lesser activity centres, is completely consistent with the model. Providing direct low frequency service patterns overlapping main links is not. This is a terribly one-sided analysis that seems to leave out many key factors. What happens now is not a very reliable guide to what will happen in future. Projecting current rail patronage onto future rail running patterns but ignoring growth from saturated car and bus travel markets. Ignoring demand from the south to west. This is a line that is likely to have much more balanced counter flows throughout the day that any of the city centric lines, making better value than one that is moderately busy one way and empty the other. Taking a large number of inner intra line, transferring and crosstown passengers off the city lines at their busiest points increases the capacity of those lines to take more citybound passengers. Providing direct crosstown links between major interchange hubs Henderson/Otahuhu and later Manukau/Mt Albert increases the effectiveness of bus services operating from those hubs. 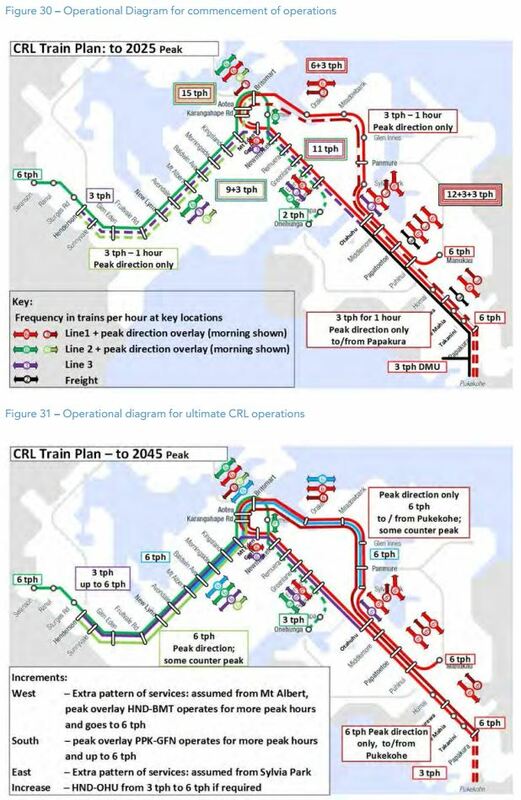 Using available line and train capacity as early as possible allows the stage 2 upgrade of CRL capacity, the cost and the disruption [both major] to be pushed out to a more preferable time. I don’t think this argument is anywhere near complete enough to stand up against the level of detail that has gone into developing the proposed running pattern in the first place. Sadly, I expect that it will poison public opinion nonetheless. “What happens now is not a very reliable guide to what will happen in future.” Quite. How many people living out west working in the Penrose / Otahuhu industrial area might switch from car to the purple line? You can’t tell from the stats quoted above, or from the west to south boarding stats either. I think there’s a counter argument that end-to-end time is a big deal. What the purple line does is stretch how far you can travel in a given time across the isthmus. In a city woefully short of affordable housing within reach of employment centres, and with painfully slow average train (and bus) speeds, this is hugely significant. The purple line can be put in place at any point in the future if it is clear demand warrants it or it would alleviate pressure in the CRL. This post is about whether it is a good use of resource from CRL opening day. Matt’s post, negative about the purple line, is based on current passenger numbers. But what if potential travellers from the south to the west and the west to the south are presently choosing to not use the train because of the time lost and inconvenience waiting for a transfer at a sometimes cold and windy Newmarket platform? What if AT had done surveys showing that many more travellers would travel west-south and vice-versa if the transfer at Newmarket was eliminated by adopting the purple line? The current trains provide great service to Grafton and Newmarket and a crap service into the city (which is why New North Road buses are still packed even when rail duplicates its route). Extrapolating current use will way over estimate travel to Grafton and Newmarket, not under estimate it. What I proposed was not extrapolation. I said perhaps AT has done surveys suggesting many more potential travellers would use the purple line because it eliminates the cold & windy transfer at Newmarket. Yes it goes both ways. What you build travel for grows in the long run (if it can be sustained). Business & residential etc populations move to suit the line. Of course it makes sense to make the centre of the city the main destination. Newmarket & Grafton are cousins to the CBD. Given you are comparing two stations to fourteen, is this any surprise? What’s the idea behind having the ‘light blue’ line between Mt Albert and Sylvia Park (in 2045 operating pattern)? Are any additional platforms are expected to be built for that or are the trains expected to turn around on the spot (without blocking the line for longer than than a ‘through’ service). Also why not Henderson (or even Swanson) to Otahuhu? For the ‘light green’ line – (Henderson – Britomart) will the new platform layout at Britomart allow to enter all the tracks from the CRL side? Or will the tracks not leading to the tunnel effectively remain an unused dead-end tracks? The core of the network will be the busiest so it saves running relatively lightly loaded services out to the edge of the network. The extra platforms will only be accessible from the east. The green line will likely ‘terminate’ at Britomart as in all passengers depart but in reality it will likely move immediately to the stabling area at Quay Park or off to the depot in Wiri. I’d expect the line to start at least at New Lynn on the Western Line – a lot of buses will still likely terminate there in 20 years time. The same for Otahuhu – which is already being promoted as a bit transfer hub. I just do not understand why stop short of the main anchoring points on both lines. New Lynn would have 12tph so will be well served anyway. However, that diagram is just a plan, it is 27 years away, if demand necessitates there is no reason the light blue line can’t be extended further west. I’m not a fan of dropping the Purple Line on the basis that the same journey can easily be achieved with transfers. Using this logic, we’d abandon the NX2 and require University-bound passengers to transfer from the NX1 to routes 22 and 24 at Wynyard. Or require passengers from Remuera on Route 75 to transfer to Route 70 at Newmarket. I’m a strong supporter of the New Network principles but I think that the logic can be carried too far and made too “pure” to the detriment of the travelling public..
(2) if the purple line is removed, then those journeys can be made via transfer. Whereas you seem to focus only on the second point. Matt is trying to say (I think) that (2) follows from (1): Those resources can be used more efficiently *and* doing so doesn’t disadvantage anyone too much as they can connect between relatively frequent services. And I don’t agree that those New Network principles can be taken “too far”. Mainly because in this case “efficiency” aligns more or less with fairness. When someone argues for a direct service in a situation where they could easily connect. then they are effectively arguing for more resources per person to be spent on those passengers compared to others. I don’t see why the users of the purple line deserve so much more spent on them than anyone else? And trust me: They will be under-utilised compared to the other services. This is it, the alternative isn’t just ‘no purple line’, it’s the trains and resources from the purple line go onto the regular line for 50% more capacity and 50% more frequency. Let’s put it another way: your western line trains are nice and full of people because they are used by people travelling along the western line, through to the city, and to connection points to get to the other train lines and various buses for trips anywhere. b) put on a special low frequency line that covers some but not all of the western line and skips the main demand centres in the city centre but veers of to serve two lesser stations, so that only people who are going to those stations and who are happy to wait for low frequency to avoid a transfer benefit. Option A leads to better service and more capacity for all. Option B leads to overloaded main line trains and mostly empty crosstown trains. A is clearly the better use of those resources and benefits the most people. The map shows westfield as a station again, I though this had been closed for good? I agree with your logic. It sounds harsh to say but sometimes changes to a PT network will lose some passengers, but overall may add more passengers than are lost. So the system serves more people. Administrators often get focused on appeasing existing passengers, politicians even more so. But planners need to think of the city as a whole. Keeping the frequency consistent is important with the destination being clear. It ould be better if we didn’t think of getting everywhere without change and so I favour Matt’s proposal. I definitely hoe to be here to use it. No purple line – no need for the half built platform at Otahuhu. The diagrams would be easier to understand if the Eastern LIne was a different colour. No there’ll still be lots of additional services at Otahuhu, as you see in the running patterns above. I don’t think Avondale-Southdown will ever be heavy rail due to lack of proper corridor in many places (taken by SH20 extension) and gradients. Perhaps in some very distant future it could be a LR via Onehunga. Correct, the rail designation is still intact. Apparently even running LR along it will still leave enough space for a double track ASL. Matt, a great idea to save $50 million. I frequently travel Takapuna to Manukau. It’s three trips. Takapuna to Victoria Park – good frequency. Victoria Park to Lower Albert – good frequency. Britomart to Manukau – 20 minute frequency off peak. It is the last one I begrudge because it is not turn up and go. It sounds a little like the Purple Line. Haven’t read all posts so apologies if someone has said this but there is another option. Run a shuttle back and forth between Mt Eden and Newmarket. Would involve some improvements at Newmarket to have a proper platform with pedestrian connection on the Western Line portion of the station. 1) Allows increased services on the Western Line into the CRL. 2) Retains an easy (and frequent – up to 10 minute frequencies) connection between the Western and Southern Lines. The purple line wouldn’t be necessary if the grade separation around Mt Eden Station was configured to allow transfers west-south. This wouldn’t require another platform as the straight through western line would only be required for freight and not need it’s currently planned platform. As somebody said, Newmarket would have platform capacity, given that nothing would be reversing there. So run shuttles (3tph) to Henderson. To those moaning about new platforms, Auckland does not have enough short-turn or passing options, the network needs more. I think it is completely wrong to have people change trains for this. I usually agree with most rail posts on this board, but in this case it lost the human perspective. Too dogmatic. It doesn’t account for growth at those stations, and critical mass overall as frequencies improve. It is also timid on western to southern access and the current suppressed demand. I think this will explode – and the network needs to offer other routings – and keep people out of the core who aren’t headed there. Another option could be to run 6tph Henderson to Onehunga, and switch the lines up. They would lose Aotea access but equally, may well have light rail too. The problem with the purple line is that it ends at Henderson and Otahuhu whereas it should be Swanson and Papakura. That would be more likely to induce pax. It would certainly introduce extra costs. I understand that Manukau is only serviced from the Eastern line now, but i stand to be corrected. 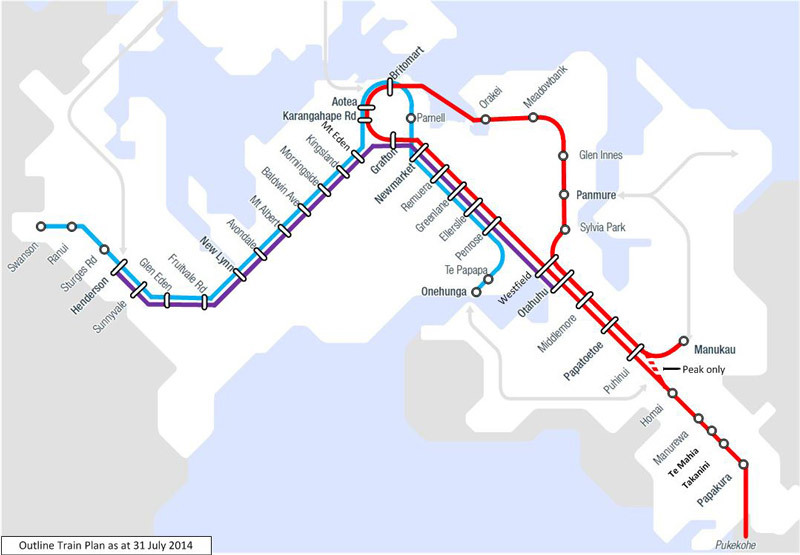 Extending the purple line to Manukau would allow it to be serviced from Southern line stations too. Would also provide a useful connection for South and East Auckland to West. If the Southdown Avondale line was built in future it could run as a two way loop. The original plan, pre-2014, was to get rid of Mt Eden station and build a new station at Newton. This would have allowed the Red Line to pass through the new Newton station on its way to Grafton and Newmarket. Essentially this would have meant that citybound people travelling on the Western line could have transferred at Newton (ex-Mt Eden) to get to Grafton and Newmarket. Transferring at Newton/Mt Eden, as you can see from the maps, is a much quicker, more logical transfer. You don’t have to go all the way up north to Karangahape to transfer. It seems that what happened is that AT realized that shifting Mt Eden station northwards and turning it into a new Newton station would have cost $166 million. Instead they decided to drop the plans for a new Newton station, and to spend $54 million on the Purple Line instead. Thus saving $112 million. There’s method in AT’s madness — though, in the long run, it probably would have been better to bite the bullet and have spent the money to build Newton station. Good point. If we are looking at the costs in a macro /project view, as well as a longer term open one, ignoring the impact of Newton on the budget is unfair. If the purple was truly created as an alternative solution to this same issue, then it nets positive. To deny that is selective to fit the narrative, and we may as well go as far as saying – well, we save a billion if we do nothing! Not quite right Cromulent, AT had always planned to keep Mt Eden station and run a crosstown service through it, even when the Newton station had left it on neither of the CRL lines. It’s really a case of trying to have your cake and eat it too, they want to build and run the new CRL but not have to change any existing users travel patterns in the process. Newton Station would also have made it impossible to grade separate the southern entrance to the CRL, this would have been a seriously short sighted decision that would have haunted us for years. I don’t know about impossible, maybe more difficult. TBH I think they just wanted to drop it so they didn’t have to build a third underground station. Also Quay Park, Newmarket, Westfield and Manukau Junctions aren’t grade separated, and will take up to the same number of trains as Mt Eden. In the context does grade separation at Mt Eden really achieve anything? Just looking at the 2045 CRL running pattern CRL southern portal looks like it has the most conflicting movements with up to 18tph crossing up to 12tph. There are plans to grade separate Westfield, so I imagine grade separation at the CRL southern entrance will be vital. Isn’t the purple line a reinstatement of a service that was in service when NZR use to run the passenger service back in the 60’s and 70’s ? Yes, because the old Auckland Station was so thoroughly useless the western trains (two a morning and two in the evening, if I’m advised correctly) used to run through Newmarket to Westfield. I believe the mostly carried a shift of workers to the meatworks there. Obviously that changed once Britomart was opened, and will change further once the CRL is open. Another point is relief and the spread of demand. If so many journeys are intra-Western, it is useful to have other services for these passengers to spread across, and create capacity for those headed into the CRL. The purples do this – so it is also the congestion ‘opportunity cost’ of NOT having them that we must consider. There is quite a AT mentality here in terms of dwelling on today’s demand and usage with no accounting for future booms – the CRL was delayed years due to this until their position was laughable. But we see that same approach in this post – no foresight or assumption. Planning for tomorrow’s usage based on today’s provision. Build it and they will come is ALWAYS robust with high quality PT servicing, this will not be any different and the demand that comes out of the woodwork will, I think, be impressive… especially given Auckland’s nature of dispersed employment locations. Not sure I agree re build it and they will come. There is already a good service between the west and the south so I doubt there is a hidden demand. We currently run 10 min frequencies on both lines with one transfer, I don’t think 20 mins with no transfers is the step change that will see a massive jump in demand. You are right in the long term it will probably be needed to take pressure off the CRL, but initially all it will do is tie up trains that could be used to boost capacity on the CRL. The line is there so we can bring it in as soon as it is needed (or a few years after knowing Auckland). The travel demand that is there must involve mode shift, though. What else do we have to do to make that substantial?